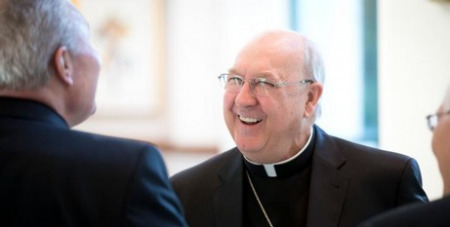 In a criticism of Archbishop Charles Chaput, US Cardinal-designate Kevin Farrell said he believes the US Bishops as a whole should have discussed pastoral guidelines for implementing Amoris Laetitia before individual bishops began issuing guidelines. Implementing Amoris Laetitia "has to be done in communion with our bishops. I think that it would have been wiser to wait for the gathering of the conference of bishops where all the bishops of the United States or all the bishops of a country would sit down and discuss these things." In September, Archbishop Joseph Kurtz, then-president of the US Conference of Catholic Bishops, issued a statement on Amoris Laetitia in which he announced that a report had been sent to Rome on the "reception and implementation" of the apostolic exhortation. The committee that produced the report was headed by Archbishop Chaput of Philadelphia, head of the US Bishops' ad hoc committee for implementing Amoris Laetitia. In July, the Archdiocese of Philadelphia issued its own pastoral guidelines on the exhortation. Since then, other bishops have issued guidelines on the document and pastoral discernment and accompaniment of married couples. Among other things, the Philadelphia guidelines state that while divorced and civilly remarried couples should be welcome in parishes and accompanied by priests, they may not receive Communion unless they live as brother and sister. Cardinal-designate Farrell, recently appointed as the prefect of the new Vatican Dicastery for Laity, the Family and Life, said: "I don't share the view of what Archbishop Chaput did. I think there are all kinds of different circumstances and situations that we have to look at - each case as it is presented to us." "I think that is what our Holy Father is speaking about, is when we talk about accompanying, it is not a decision that is made irrespective of the couple," he said. "Obviously, there is an objective moral law," he said, but you will never find two couples who have the same reason for being divorced and remarried. Contacted by Catholic News Service, Archbishop Chaput said the guidelines he issued "have a clear emphasis on mercy and compassion. This makes sense because individual circumstances are often complex. Life is messy."